Investors in the week ahead will receive an update on Switzerland’s unemployment rate, amid continued strength in its labor market, despite certain companies’ ongoing efforts to slash their workforce. Although some firms, including Austrian bank Raiffeisen and Swiss pharma giant Novartis, have recently announced plans to cut jobs in Switzerland, the country’s employment base continues to be robust. However, employment growth is apparently easing, and wage growth generally remains weak. Meanwhile, lower consumer prices – combined with accommodative central bank monetary policy – have likely helped Swiss equities to achieve gains this year. Although some firms, including Austrian bank Raiffeisen and Swiss pharma giant Novartis (NYSE: NVS), have recently announced plans to cut jobs in Switzerland, the country’s employment base continues to be robust. Switzerland’s unemployment rate fell to 2.7% in February 2019 from 2.8% in the prior month, with the number of unemployed having decreased by 17% month-over-month to 24,457 people. 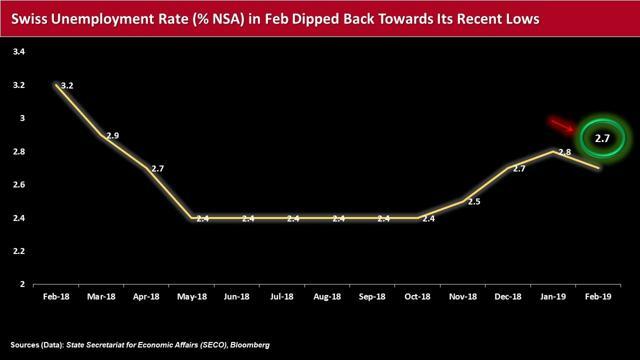 According to the nation’s State Secretariat for Economic Affairs (SECO), both youth unemployment (aged 15 to 24), as well as those aged 50 and over, saw declines in February of 5.1% and 2.7% from the previous month, respectively. However, SECO also warned that Switzerland’s economy had “cooled off significantly” in the second half of 2018 – mainly as a result of global trade and Swiss foreign demand – and expects it to regain momentum only gradually this year. The growth outlook in other European countries, notably Swiss key trading partner Germany, has recently become much gloomier, and as a result, international demand for Swiss products has weakened, and the export economy has been losing steam. 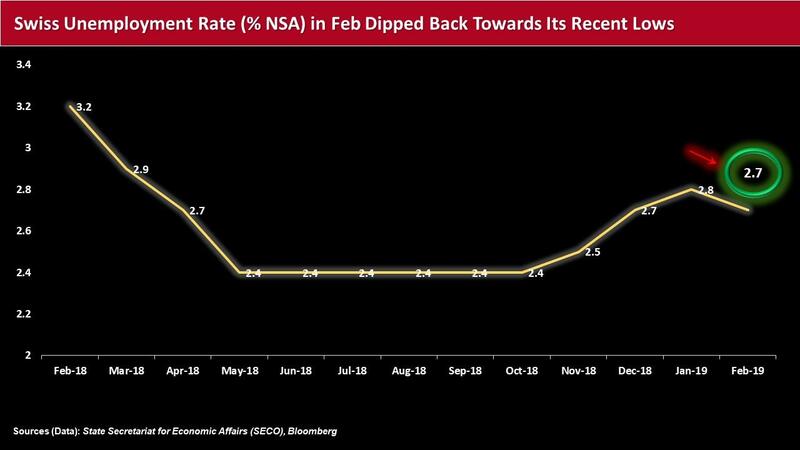 SECO further observed that the economic slowdown is also having an impact on the Swiss labor market, despite average unemployment for 2019 residing at a still-low 2.4%. Employment growth is apparently easing, and wage growth generally remains weak. Overall, SECO’s expert group noted it has lowered its outlook for Swiss GDP growth in 2019 “significantly” from expectations of 1.5% in December 2018 to 1.1%. Against this backdrop, although SECO said that lower inflation (annual inflation for 2019: 0.4%) has been “bolstering households’ real purchasing power,” private consumption is seeing below-average development. 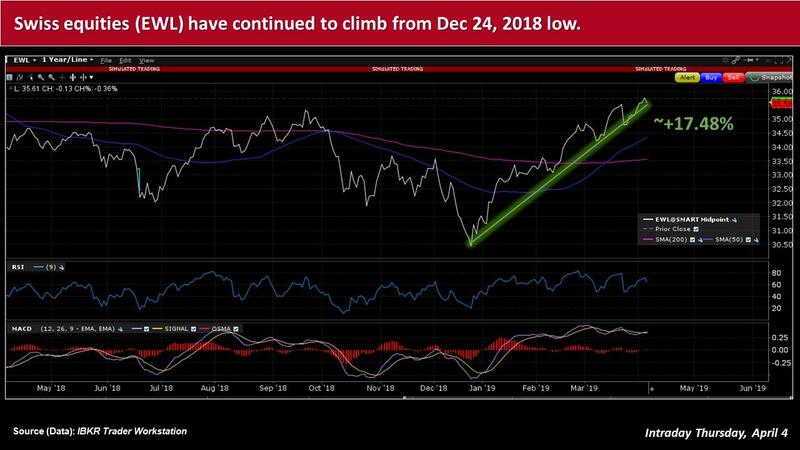 However, lower consumer prices – combined with accommodative central bank monetary policy – have likely helped Swiss equities to achieve gains this year. 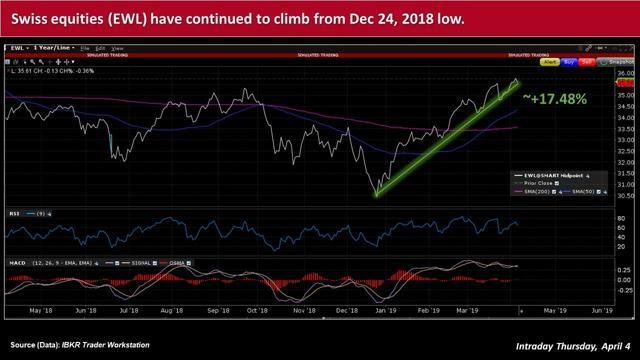 The iShares MSCI Switzerland ETF (NYSEARCA: EWL), which includes among its top holdings Nestle (OTCMKTS: NSRGY), Novartis and Roche Holding (OTCMKTS: RHHBY), has increased nearly 17.5% from its most recent 52-week low set on December 24, 2018. Certain cost-cutting strategies of some companies operating in Switzerland have not been helping to bolster the country’s employment figures. St. Gallen-based Raiffeisen Switzerland, for example, said Thursday that as many as 200 jobs will be downsized as part of its aim to achieve CHF 100m in cost-savings by 2020. The bank said a “substantial part of the reduction can be achieved by natural fluctuations,” as well as anticipated retirements. Raiffeisen’s cuts follow Novartis’ plans to slash around 1,000 jobs in Basel, Schweizerhalle, Stein and Locarno by 2022 as a result of the continued global transformation of its manufacturing network and service businesses. The company said the reductions, which were announced in late September 2018, reflect its construction of a cell and gene therapy production site that could create 450 new jobs in Stein. Novartis added that it expects about 10% of its global workforce will be maintained in Switzerland, where it generates less than 2% of its total sales. Investors will likely be keeping an eye on further corporate strategies that involve workforce reductions, as momentum in Switzerland’s domestic, as well as the global economy, face a long list of headwinds, including slowing growth and geopolitical shifts – namely uncertainties over Brexit developments. Note: This material was originally published on IBKR Traders' Insight on April 4, 2019.